It’s a wonderful motivating phrase. It suggests that anything is possible; that there are no limits. To infinity and beyond and all that…. As I’ve discussed already in Differentiation and Challenge and Journeys, the straight-jacket of one-size-fits-all learning activities is deadly. In Great Lessons, it should be our default-setting to think BIG and allow for individuals to take different paths. BUT in the context of routine teaching in a regular classroom, these wishful platitudes don’t get you very far. There’s a lot more to it. “What would you like for tea?” I say, trying to treat them like adults. Answer Alternative B: ” What is there?” ie…. I’ll choose but you need to narrow down the parameters a bit. They’re hardly likely to request a trio of deconstructed Lamb pies with an asparagus couli! This applies to learning too. Sometimes your instinct is not to give any clues because you want to see what you get if students are left to their own devices. This is the spirit of our Year 7 British Museum Project. We hardly give any advice at all and we’re continually bowled over by what the students come up with. Take a look at the outcomes in that post. However, truth be told, at the other end there is some pretty mediocre work. In this ‘blind test’ some students don’t know what they are capable of and sell themselves short. They choose pasta. So, should we really be offering an open choice – or is it better to start with a limited menu to get them started. 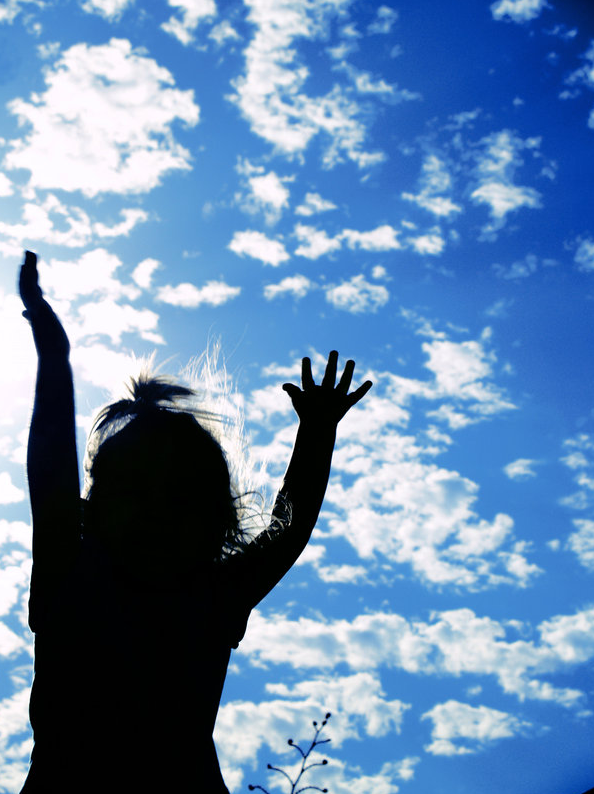 Thinking big is important but if ‘the sky’ is our aim .. students are going to need some idea of what that looks like in this lesson… and what might be a reasonable means of getting there. That is a secret to a Great Lesson; to set audacious goals – but to make them possible; to set each student an almighty challenge but to give them the confidence that it can be done and the tools to do it. Now here is a paradox of sorts…if you give an example of how to do something, are you simultaneously limiting horizons? 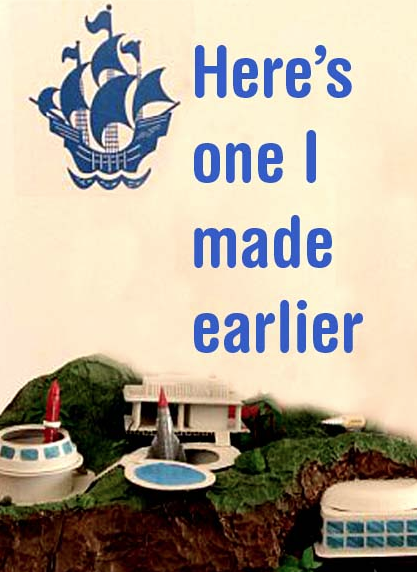 Are we just doing a Blue Peter ‘make’ – here’s one I made earlier? The classic ‘Tracy Island’ made from Fairy Liquid bottles..
With this approach (which I have seen time and time again) we just get lots of the same thing made with varying degrees of accuracy. There is no imagination or creativity required; not much thinking, just the capacity to follow the recipe. For example, I have seen too many KS3 ‘projects’ in the past that were just indistinguishable carbon copies; and too many teachers happy that every student has ‘finished’ even though some students could and should have gone far, far, further but were never directed or enabled to do so. One of my least treasured school-memories is of a particular homework composition task for Music O Level. We wrote our pieces and the teacher played them to the class on the piano. Mine came up early and everybody laughed. Why? Because it was just awful.. boring, simple and very short. Then came Sarah’s. She’d written a fugue! A full-blown fugue; I kid you not. Now, the teacher had said to compose a piece using cadences and counterpoint…. I had done that; but it was only about four bars long. I simply didn’t realise what the expectations were; what might be possible! We weren’t given any exemplars until afterwards. If only I’d heard Sarah’s fugue beforehand…I’d have aimed quite a bit higher!! Year 8 drawing skills. The student then developed the idea further, mixing colour with pencil. The annual Art Exhibition is a useful show-case of student work that teachers and students and feed-off all year. Simple but effective use of photography, some jars and masks. From Y7 starter-projects to the free choice of AS/A2 Coursework. In other areas, showing the work is more complex but there are lots of ways of doing it. The routine use of visualisers that enable a whole class to see work in detail is really useful – and we have made sure that these are available throughout our school. Here, for example, is my ipad set up as a visualiser – but we have others made from web-cams fitted into flexible angle-poise lamp stands. 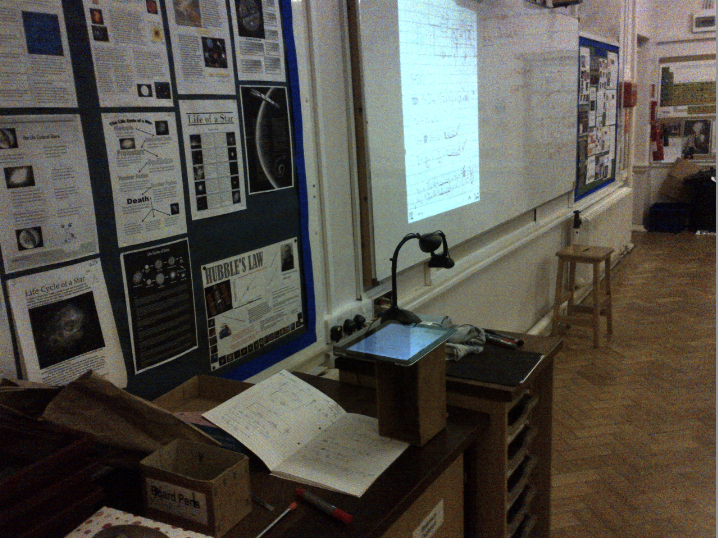 Exemplar book-work projected via my ipad to explore the possibilities. An English Department colleague described how his Year 10 class were keen to look in detail at each other’s work using the visualiser so that they could see and discuss, in detail, what the possibilities were. This followed a process of self, peer and teacher evaluation of some early GCSE essays. 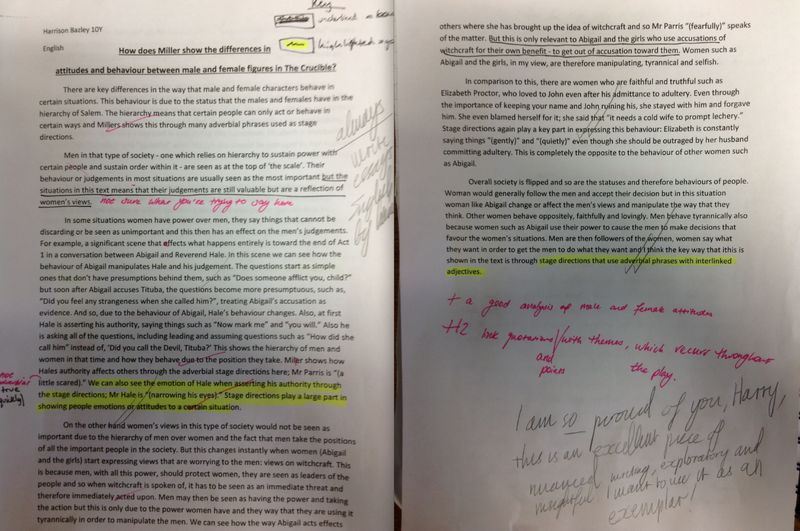 Underlining and highlighting the strengths and weaknesses, prior to discussion. 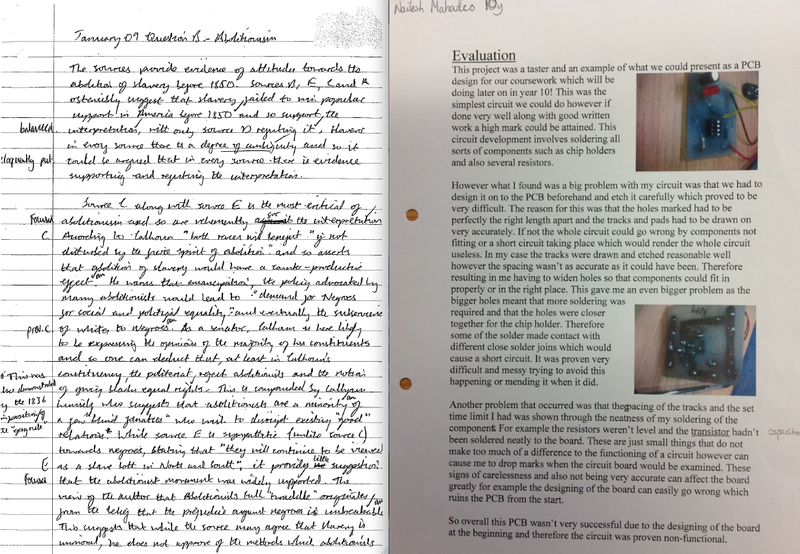 A Y13 History essay; Y10 Electronics GCSE Evaluation. A new and unusual task can be daunting because of its unfamiliarity. 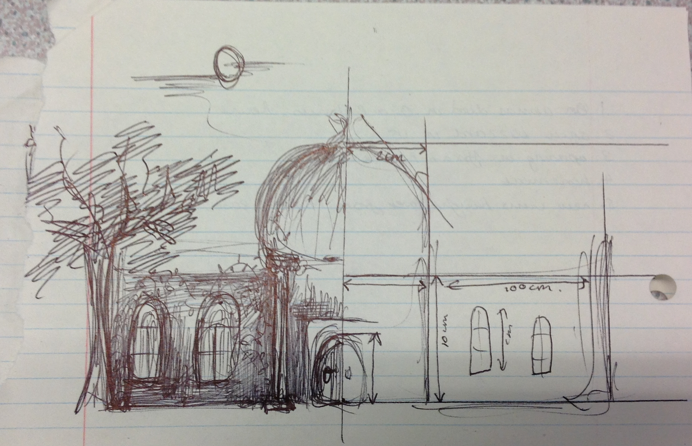 This is an example of what is possible in the regular ‘3 minute sketch’ challenge in General Studies. To someone who’d never have thought of doing something like this, they get a big steer. A door unlocks. And here are some regular homework tasks that the teachers thought had modeled high standards for others to follow. They served as material for further critique and discussion. 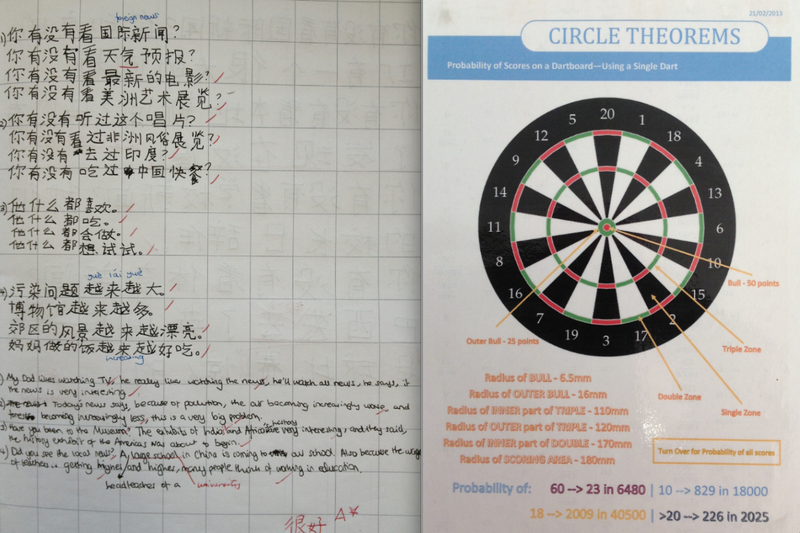 Chinese characters and a superb piece of work on probability in Maths. Effective peer critique methods have featured in recent posts by Alex Quigley and David Didau; it is really important that everyone can learn from the work of others and that the peer assessment has a positive impact. These posts are excellent. The Invisible Hand; showing the possibilities. This is a really great read. It is refreshing and exciting to see a Headteacher place such value on creative development, and then be able to unpick it so articulately, with such great examples from across subject areas. The example, Art vs Science has set me off thinking – appreciate it is only a quick activity but brings to mind Austin’s Butterfly challenge: ‘look like a scientist’. I had some niggles with that which I posted about, but at least Austin wasn’t shown a detailed drawing of a butterfly and then told to copy it….although arguably not far off. Have now! Thanks for pointing me towards this, once again a great read. That’s my butterfly; thanks for helping me form my net!